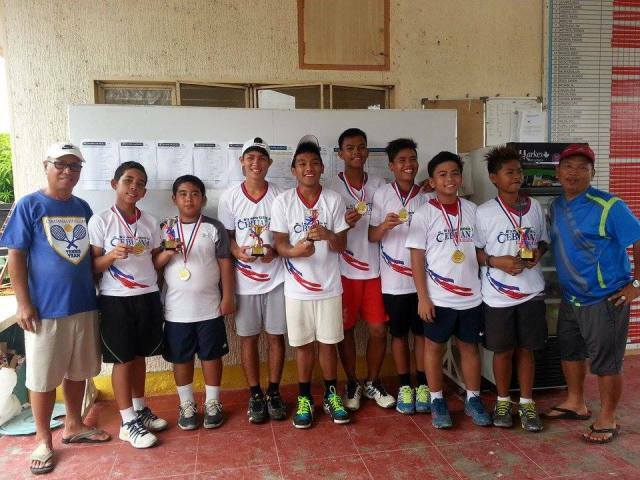 Iriga bets stamped their class in the recently-concluded Cebuana Lhuillier age group tennis championship series in Legazpi City, winning six of nine individual categories. Jhon Harold Trillanes and Nikka Alanis bagged two titles each in the leg that attracted 98 entries. Trillanes beat Cavite’s Rainier Selmar, 4-0, 1-4, 4-0 in the boys’ 12-Under finals and Lucena’s Jerome Ignacio, 6-2 , 6-4, in 14-U. Alanis whipped Ma. Patricia Lim, 6-1, 6-1, in 16-U and Lucena’s Lila Salvacion, 6-0, 6-1, in the 18-U championship. The other Iriga City champions were Glydel Guevarra in girl’s 12-U and Patricia Corporal. Bulaca’s Justin Prulla averted an Iriga sweep by ruling the boys’ 18-U over Iriga’s Vincent Alanis, 6-1, 6-1, while Nolan Gagalac of Naga and Patrick Luis Salvacion of Lucena took the boys’ 16-U and 10-U unisex titles, respectively.